Former Prime Minister Tomiichi Murayama (right) and former Chief Cabinet Secretary Yohie Kono talk about the 70th anniversary of the end of the war at the Japan National Press Club, Tokyo on June 9. 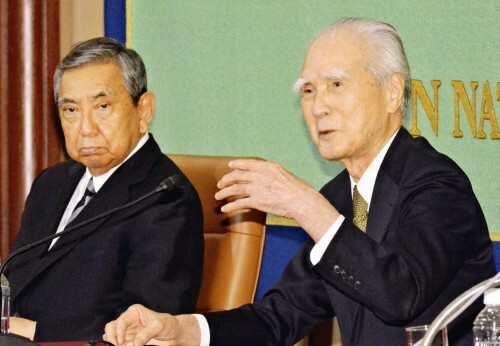 On June 9, former Prime Minister Tomiichi Murayama and former Chief Cabinet Secretary Yohei Kono talked about the 70 th anniversary of the end of the war. The talk was sponsored by the Japan National Press Club in Tokyo. Prime Minister Shinzo Abe plans to make a statement marking 70 years since the end of World War II this summer. Murayama urged Prime Minister Abe to honor the spirit of the ‘Murayama statement’, which was issued in 1995 marking the 50th anniversary of the end of the war. In the statement, then-Prime Minister Murayama expressed remorse and an apology for the country’s past colonial rule and military aggression across Asia. Kono said the statements upheld by past governments should not be watered down.